"A delicious, easy company dish - the flavors are wonderful. A favorite with my family. I usually double the recipe so we can have leftovers." In a large saucepan, melt butter over low heat. Stir in the package of dressing mix. Blend in wine and golden mushroom soup. Mix in cream cheese, and stir until smooth. Heat through, but do not boil. Arrange chicken breasts in a single layer in a 9x13 inch baking dish. Pour sauce over. Bake for 60 minutes in the preheated oven. Twenty minutes before the chicken is done, bring a large pot of lightly salted water to a rolling boil. Cook pasta until al dente, about 5 minutes. Drain. Serve chicken and sauce over pasta. 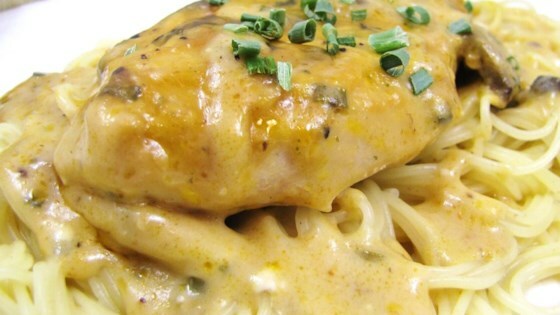 See how to make a super-simple, creamy baked chicken and pasta dish.